If you’re hesitating between these terms, you’re not alone. In fact, even various levels of the Canadian government can’t seem to agree on what best to call this segment of our population. This definition focuses almost entirely on colour. Here’s the problem with that: white is a visible colour. In fact, for racism to operate, members of a race have to be visible in order to garner or lose social favour. wholly apparent to others? In light of this, the term “person of colour” is cast into an equally suspicious light—who is NOT of colour? What these terms seem to suggest, but fail to say outright, is that some members of our society are more noticeable than others. What exactly constitutes noticeability, though? This brings us to the other part of that term: “minority,” which alludes to a number. So what are the numbers? According to the 2011 Canadian census, 20 per cent of Canada’s population was categorized as “visible minorities.” However, in the most populous cities of Toronto and Vancouver, this number rises to 50 per cent, according to Statistics Canada’s 2016 National Household Survey. Is “minority” really the right term to describe such demographics? If it’s not about numbers and the use of “colour” and “visibility” is problematic, what are we left with? We are essentially trying to speak to each other in a language that does not exist. According to the Ontario Human Rights Commission, “racialized”—as in “racialized person” or “racialized group”—is the term du jour. And what an intriguing term it is. Rather than focusing on colour or the size of a community, it suggests that an individual or group has been ascribed a certain identity—one with which they might not concur. But how many of us have actually used or even heard of this term? If a Google search is any indication of our lexical usage, “racialized person” could be found 6,680 times. “Visible minority,” on the other hand, had 349,000 hits and “person of colour” had 531,000. Despite their relatively common use, “racial minority,” “visible minority,” “person of colour” and “non-white” have all been deemed “outdated and inaccurate terms” by the OHRC. How is it then that two publicly-funded governing agencies cannot agree upon terminologies to describe segments of our population that have existed for centuries? Yes, centuries. The first recorded Black person arrived in Canada in 1605. The first Chinese settlers arrived in the late 1700s. Indians arrived in the early 1900s. One wonders how long you have to live in a land to be considered part of its popular fabric. It doesn’t matter how intriguing or clever a term like “racialized person” is if no one uses it or even knows that it exists. This brings us to the greater question: Why? Why don’t we have access to or knowledge of words that matter to members of our society? Perhaps the best way to answer this question is with another question: What does it mean to know a word? At the most basic linguistic level, we could say that the speaker knows the semantic properties of a word, in particular what concepts it invokes, what its descriptive limitations are and how it’s used in discourse. These are all necessary components of ensuring comprehensive communication between parties. 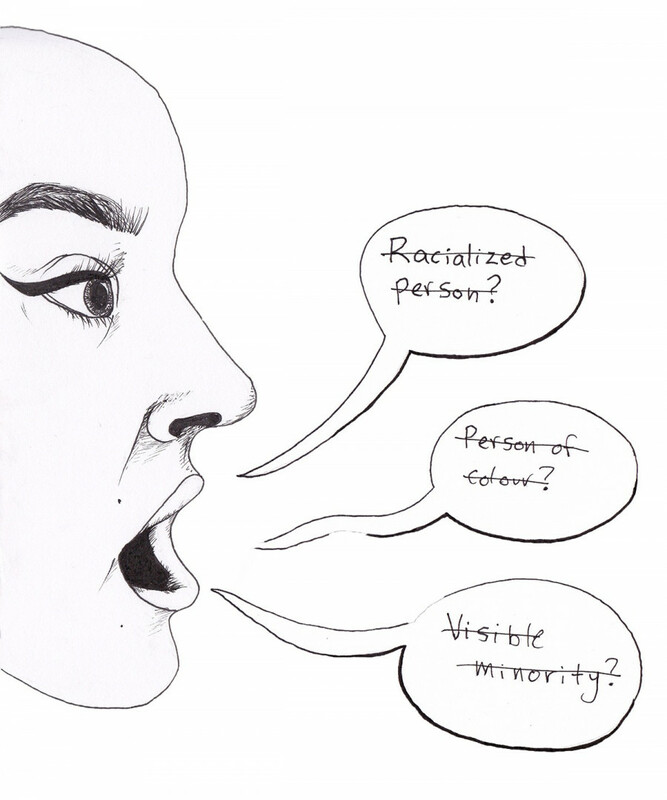 The effect of this “wordlessness” bears out uncomfortable dialogues between people who don’t want to sound racist and those who are tired of explaining racism. We are essentially trying to speak to each other in a language that does not exist. Is it any wonder that we are all exhausted by race issues? By the way, when was the last time race was actively discussed in your classroom? If your experience has been anything like my own, then it would be never. Never have I received a single lecture or lesson from elementary up to high school that discussed the fundamentals of race. I grew up under the belief that being born in Canada meant that I was Canadian, so you can imagine my bewilderment when someone asked me the now-classic question: “Where are you from […] like, really?” Having never been taught how to identify or navigate a situation that could be considered racist, I answered the only way I knew how: “I’m Canadian.” That answer fell flat. In the end, this gap in our collective knowledge and our lexicon has a direct impact both on those who have been targeted by racism and on those who perpetuate it. Victims may have a hard time processing the mental anguish of a racist comment or attack if they are given no psychological tools to maneuver the complex feelings of alienation and hurt. In addition, perpetrators may feel emboldened to publicly exercise their ethnocentric views because no social boundaries were ever explicitly drawn. Being hindered in our ability to even discuss race, because the terms have not been agreed upon and because no instruction has ever been received, perpetuates societal ignorance and ensures that we cannot move forward with any kind of social resolve. I want to talk about race. Don’t you?